79% Polyester, 14% Polyproplene, 7% Nylon. 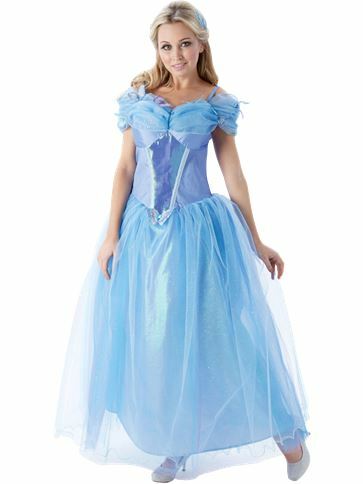 Slip away into the night with this adults Cinderella Costume. This fabulous Cinderella dress is based on the gown worn by the beautiful Lily James in the 2015 Cinderella movie and consists of an elegant, full-length, pale blue ball-gown with a pretty portrait neckline decorated with butterfly accents. This exquisite Princess dress boasts a full-length skirt with an iridescent base-layer with a sparkling, semi-sheer overlay. This truly dazzling Disney costume also comes with a co-ordinating comb headpiece with matching, colourful, butterfly accents.